Easter is right around the corner and not only am I excited about making my favorite carrot cake recipe but also I AM HERE FOR ALL THE APPS. Anyone else? I have fond memories of Easter, which is why it continues to be one of my favorite holidays. When I was young, my auntie Roxie would make us feasts that were so gigantic you could feed a room of Viking warriors, or at least that’s what it seemed like when I was little and my stomach could only handle one tiny plate full of mashed potatoes. Our typical menu consisted of pineapple and clove ham, turkey mashed potatoes, gravy, sweet corn (sometimes creamed), au gratin potatoes and green beans. Dessert was usually a French Silk Pie from Baker’s Square (who else remembers BS?!). 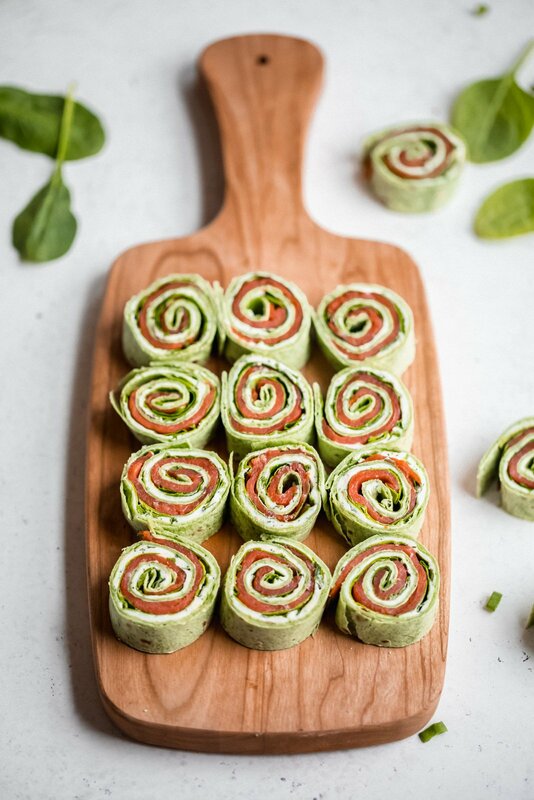 This year I’ve got another easy appetizer for you to add to your menu: smoked salmon pinwheels! 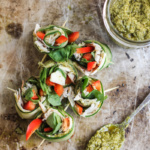 They’re ridiculously simple to make, healthy, can be made ahead of time and are the perfect way to add a little color to your menu. Not into celebrating Easter? That’s fine! 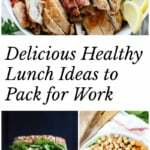 Make these for a healthy on-the-go lunch! Step 1: Lay out 2 of your favorite burrito-sized wraps. 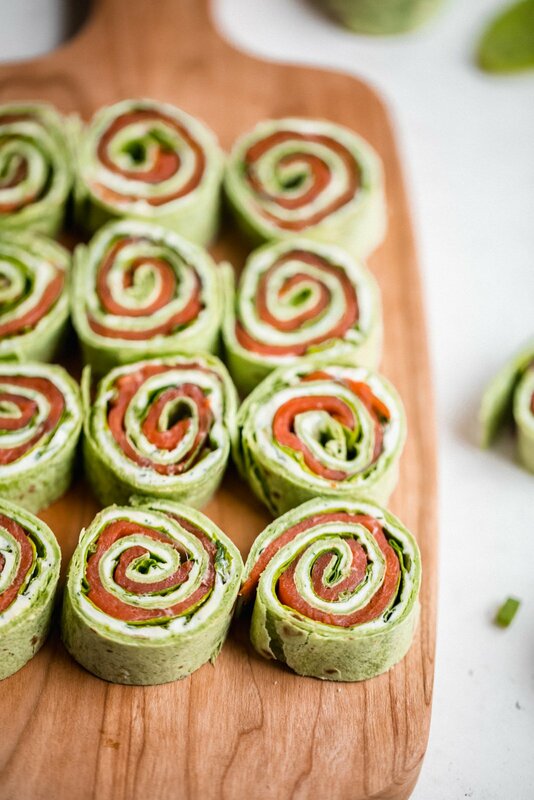 We like to use spinach, but whole wheat or gluten free wraps would also work well! Step 2: Mix together cream cheese, fresh dill, chives, and garlic powder in a bowl. 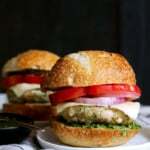 If you want to simplify the recipe even more, I suggest using a chive or dill cream cheese. 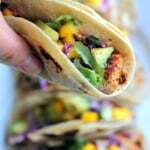 Spread all over both tortillas. 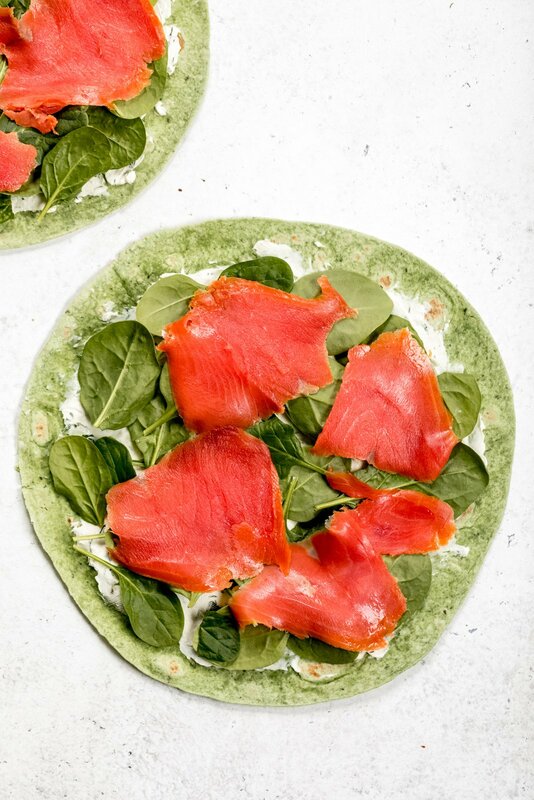 Step 3: Add spinach and smoked salmon on top. Tightly roll up and then cut into 1 inch rounds. Enjoy! 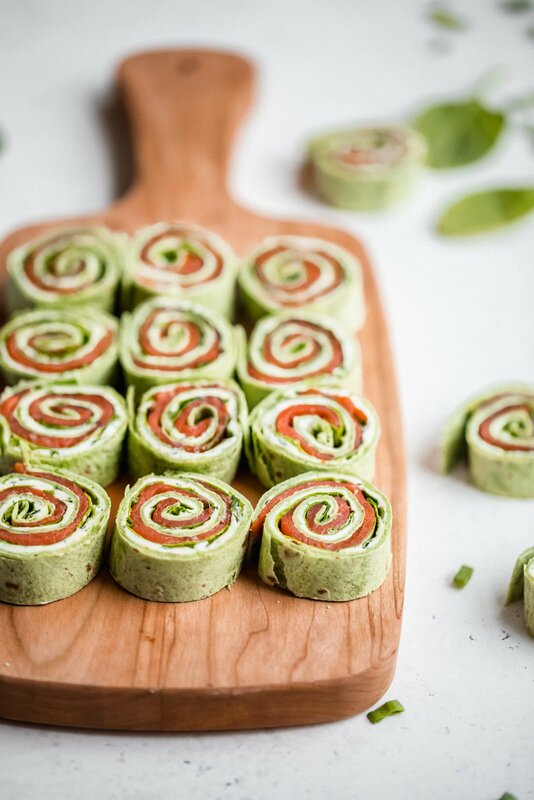 I love how simple, delicious and healthy these pinwheels are! If you’re not into smoked salmon, feel free to sub smoked turkey deli meat! In a small bowl combine cream cheese, dill, chives, and garlic powder. Mix until well-incorporated and creamy. 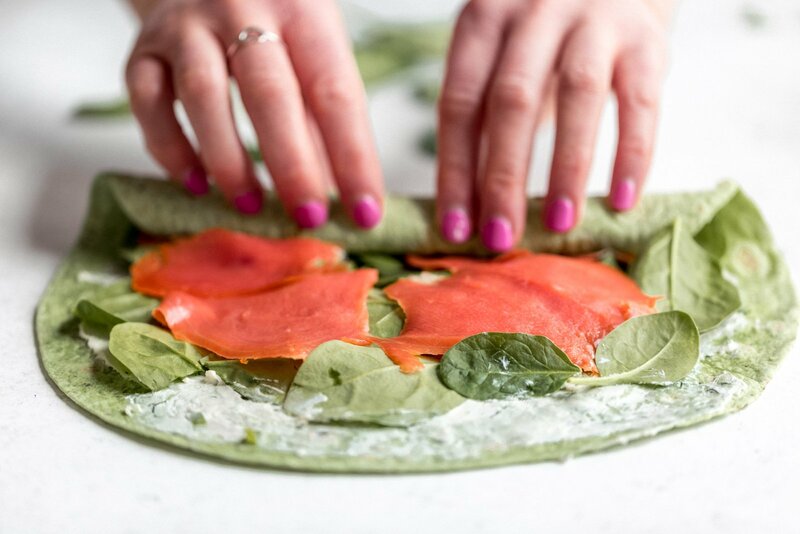 Lay out both wraps and evenly spread the cream cheese onto each one, leaving about a half inch of room around the edges. Spread the cream cheese out to the edge on one side, as you’ll use this side to “seal” the pinwheel. 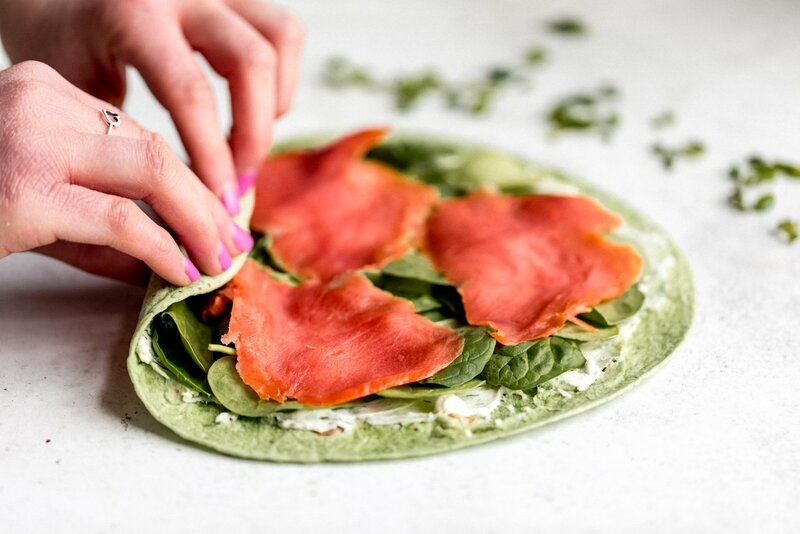 Evenly distribute the spinach between your two tortillas, followed by the smoked salmon. Tightly roll up each wrap, tucking in the ends as you go. It’s important to roll these as tightly as possible so that the pinwheels stay together when cut. 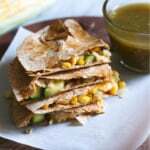 With a small serrated knife cut the edges off of each wrap, and then cut each one into ½ inch rounds. You should get about 14-16 pinwheels, 7-8 per wrap. Feel free to assemble as-is or stick a toothpick into each pinwheel to serve. Serves 4. To make dairy free: Use a vegan cream cheese such as Kite Hill. Did you make this recipe? If so, please rate the recipe and leave a comment below to let us know how you liked it! Thank you — xo! 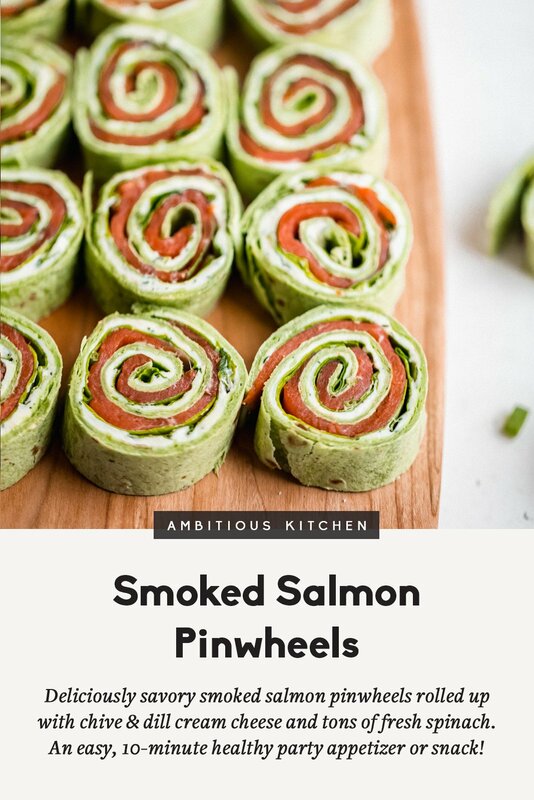 15 Responses to "10-Minute Smoked Salmon Pinwheels"
I make these all the time as a quick appetizer for holiday dinners. 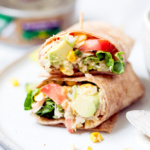 A make-ahead tip: wrap each long cylinder in plastic wrap and place them in a ziplock bag. These will keep overnight and can be sliced just before serving. ( I would not make them ahead for longer than overnight because they can go soggy. ).If all of your crowd will not eat smoked salmon, you can a substitute thinly sliced black forest ham. Great recipe! Love that tip! Perfect for holidays. These are brilliant, Monique! 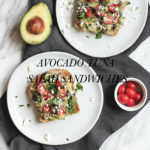 I cannot wait to try these rolls, they sound like such an easy on-the-go lunch too or a travel-friendly picnic lunch! Perfect! Glad you liked them! I love this and i am madly excited to try this in my kitchen ! Hi Mike! Thanks so much for your comment. Glad you’re finding recipes you love here! I made these for a work bridal shower. First of all, EASY. Secondly, AMAZING. Can’t beat that combo! My co workers were eating them at 8am and people were saying I thought we had to wait!??! They were gone quickly! Perfect!! Love that. Such a great party app!